The John W. Dickhaut Library, named for MTSO's founding president, is the school's primary information and research resource. With more than 130,000 volumes onsite, the library offers borrowers access to 48 million volumes thanks to its membership in the Ohio Private Academic (OPAL) and OhioLINK consortia. It also provides access to roughly 30,000 online and print journals. Policy regarding food and beverages while visiting the library. Procedure for donating print material to the library. Following the guidelines below helps to insure the health and safety of all library users and a long life for library collections, furnishings, and equipment. Library users are asked to be considerate of others and to avoid consuming food items that create messes, strong odors, and/or noise. Acceptable food: “Snack size” containers of chips, cookies, candy, and other snack foods; small amounts of finger foods (e.g., small size fruits and vegetables, dried fruits and nuts, string cheese); candy bars, granola bars, power bars, etc. ; and other snack foods that are not messy and lack a distracting odor. Unacceptable food: Hot entrees, e.g., burgers, French fries, pizza, noodles, sub sandwiches, burritos, tacos, soup, large size bags or packages of chips, crackers, cookies, doughnuts, salad, etc., and other foods that are messy and emit a distracting odor. in other areas as posted. Please be considerate of other library users. We therefore ask that you act responsibly when consuming food and drink in the library. Please bring all food garbage to the lobby to discard on your way out of the library. Food garbage should not go into the trashcans that are in the library. Please collect up and bring out your trash. Please clean up after yourself. Help us keep work surfaces clean. Please report accidental spills to the circulation desk as soon as possible so that they can be addressed quickly. Library staff has final approval of any sort of food, beverage, or container allowed in the Dickhaut Library, and reserve the right to exclude any food, beverage, or container for any reason. Users disregarding the Food and Drink Policy will be asked to leave the .ibrary. The classrooms on the lower or ground level of the Dickhaut Library are not subject to the above restrictions. However, anyone eating in those classrooms during a scheduled class is expected to dispose of food wastes in the large receptacles provided. Due to limited shelf space, proposed gifts of new or used materials are subject to acceptance by library staff. The materials are evaluated based on their relevance to supporting the curriculum and mission of the Methodist Theological School in Ohio. If you are considering a donation of print materials, please first contact the library director of Dickhaut Library at 740-362-3435 or library@mtso.edu two weeks before bringing any books to the library. No gift materials delivered to the library without consulting the library director beforehand will be accepted. Receiving and processing gifts: The director of Dickhaut Library will acknowledge each gift with a letter. However, because of legal restrictions, Dickhaut Library is unable to assign value or provide appraisals of gift materials. A donor is entitled to an income tax deduction within Internal Revenue Service regulations. The donor must file IRS Form 8283 if claiming a deduction for non-cash gifts totaling $500-$5,000 within a calendar year. Thank you for considering giving to the Dickhaut Library. 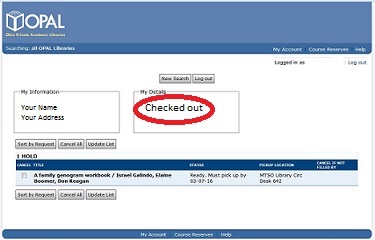 To access your library account while browsing the Library Catalog, click the link to My Account in the upper right hand corner of the catalog. The screen will display all material checked out, on hold at the library, and the status of requested material. Select Checked Out in the My Details box to view all borrowed material. 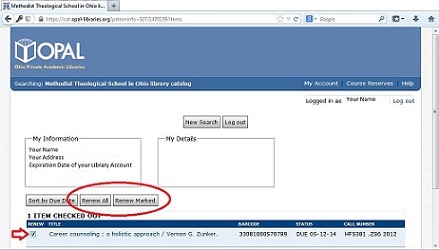 PLEASE NOTE: Interlibrary Loan (material not requested through OPAL or OhioLINK) will not be displayed. Material can be renewed through My Account as long as no other patron has placed a hold on it. Please contact the circulation desk for assistance. 740-362-3450. Thank You. Items are held at the circulation desk for 2 weeks. 90 days with 3 renewals unless a hold is placed. 21 days with 4 renewals unless a hold is placed. 42 days with 6 renewals unless a hold is placed. 21 days with 6 renewals unless a hold is placed. 14 days with 3 renewals unless a hold is placed. 7 days with 3 renewals. You will receive a series of overdue notices before fines begin to accrue. On the day that fines accrue the do so at the rate of $0.25 per day back to the original date due. BILLED items (overdue 30 days) $125.00 + added fines or fee determined by the owning library. Returning an overdue or Billed item will not eliminate fines or fees. Borrowing privileges are restored upon payment of the fine balance. Please contact the library circulation desk at 740-362-3450. Thank You. Printing, copying, scanning for MTSO and Non MTSO patrons, use and cost. Located on the main level of the library. Money to your copy account can only be added by the Business Office. PLEASE NOTE: Adjunct Faculty - please go to Gault to have copies made. We recommend you bring your own USB drive to download full text material you may find while using the library's computer workstations. Copying from print material only. Cash payment at the circulation desk. No printing from computer workstations available. No scanning to USB drive available. Dickhaut Library has three computer workstations located on the main level of the library. Must be a resident of Ohio. Please bring a photo id with you to show at the circulation desk. 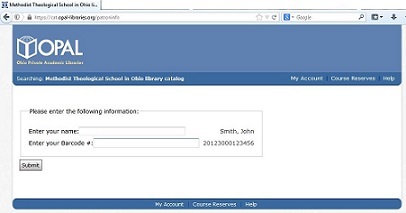 Library Card - your student ID continues to serve as your "Alumni" Library Card. 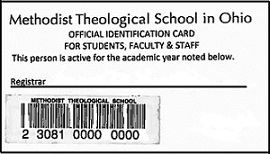 However if you no longer have your student ID, a new library card can be issued to you at the circulation desk. Please bring a photo ID and be prepared to fill out a short application form. There is no fee involved with renewing your alumni status. Alumni status is verified through our registrar's office. - No renewals available if a hold is existing on an item. - No holds can be placed on OPAL or OhioLINK items. 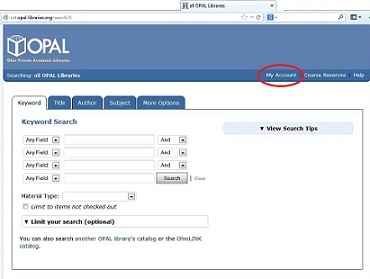 - No Interlibrary Loan (ILL) services beyond OPAL or OhioLINK. - Courtesy emails are sent out prior to the due date. Returning an overdue item will not eliminate fines or fees. Regional members of the clergy residing in Delaware County or any of the contiguous counties: Franklin, Knox, Licking, Marion, Morrow, and Union have free access to the Dickhaut Library collection. If you do not reside in any of the contiguous counties, please see the information about Visitors. If you are an Alum of MTSO, please see the information for MTSO Alumni. No Fee is associated with Clergy from the contiguous counties. A paper library card with a barcode is issued to you at the time of your visit to the library. Printing/Copying - Please see: Library Technology.